We strive to educate our customers, so they can make the most informed choice when selecting a juicer or other product we offer. 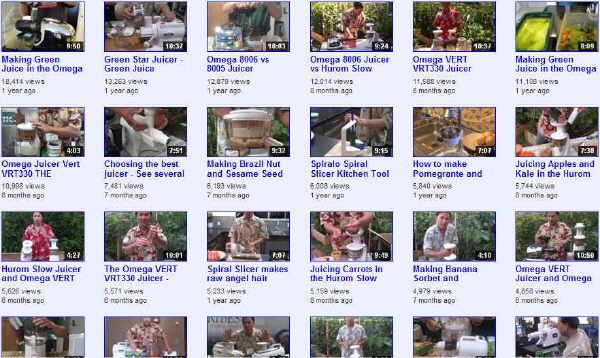 We were the first juicing retailer in March 2000 to create videos for our customers to watch in real time using real streaming technology. We have been dedicated to educating customers about juicers and other health appliances since the day we started our business. Starting in 2008, we partnered with YouTube to host our over 150 video demonstrations that make it possible for you to give you the "almost hands on" experience with almost every product we offer. Including informative "Juice-Off" comparisons and fun along the way. Thank you for supporting us so that we can continue our mission: To offer the finest products at the lowest possible price to help people maintain or achieve a healthier lifestyle. Please click this link to visit YouTube to see all our videos.